If you saw my planner comparison post a couple of weeks ago, you may have decided a Hobonichi is the planner for you. You may now be stuck as to where the best place is to buy Hobonichis. Put off by the Japanese website and expensive shipping from Hobonichi direct, you may be keen to see the alternatives. Here I’ll run through the ones I’ve used along with a few pros and cons of each. Hopefully it’ll solve where to buy, and then all you’re left with is the big choice of which one! As I’m UK based, everything will be based on cost of getting here. Cost: Cheapest around, as it’s direct from the company. Service: Can take a little while to dispatch, particularly in busy times. Shipping: Expensive! But pretty quick. Customs: Nearly always get hit, plus the dreaded handling fee from Parcelforce. Pros: Has the whole range (excluding any exclusives, like the Loft edition), including the accessories. You receive the Hobonichi store exclusives with your order that change each year. Cons: Can take a while to dispatch, can be quite expensive due to shipping and handling charges. It made sense to start with Hobonichi directly. I feel like it’s good to order from Hobonichi direct at least once for the experience. You get a cool Hobonichi box that changes each year, the store exclusives which this year were a pen (there’s always a multi colour pen) and a bear paperweight (although you didn’t receive this if you only ordered the Weeks). You might not be so bothered about the free gifts and are therefore wondering what else there is to make you want to order direct. For me, it’s the choice. 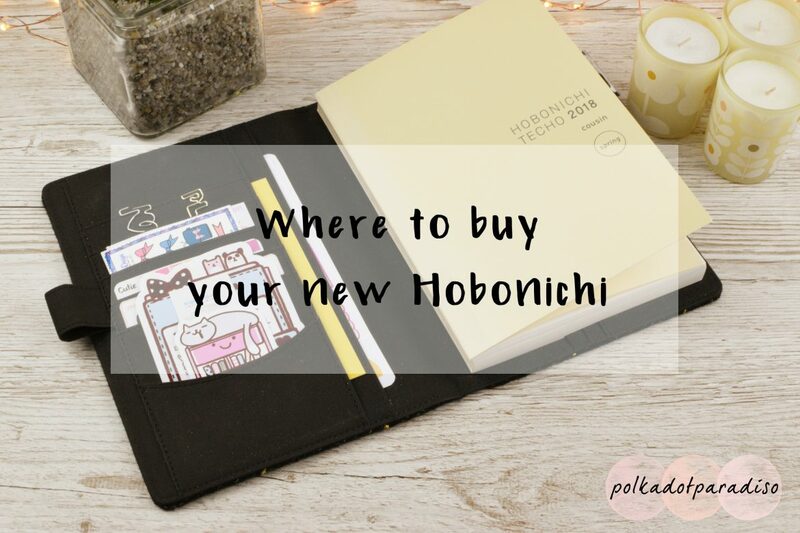 Hobonichi do a great range of accessories that you can’t always get elsewhere. I regret not adding the Rivet Band to my order because I now can’t find one to purchase anywhere. Therefore, if you want quite a lot of different items, and don’t mind waiting a couple of weeks for your order, ordering direct is the way to go. Cost: You’ll pay a bit more for the item as it’s a reseller. Service: Each shop will give you the turnaround time on the listing. Pros: You’ll be able to get your item a lot quicker. Won’t get stung with a customs handling charge. Can sometimes find now discontinued items. Cons: A little more expensive than buying direct, and generally doesn’t include the store exclusives. So while I’ve used Etsy a million times, I’ve never purchased a Hobonichi from a UK seller. Someone who does get mentioned a lot and rated highly, is Tinker Trades. The seller regularly places orders from Hobonichi and so stock will fluctuate quite a bit, particularly around the time of a new release. If you want to pick up a planner quickly, this is definitely the route to go. Cost: You’ll pay a bit more for the item as it’s from a reseller. Shipping: Varies a lot, but generally cheaper than Hobonichi direct. Customs: You don’t always get hit, depending on the seller. Pros: Being hit with customs isn’t guaranteed. Can sometimes find now discontinued items. Cons: A little more expensive than buying direct, and generally doesn’t include the store exclusives. Some stores have longer turnaround times than others. I bought both my Weeks for this year and my A6 through International sellers. I didn’t get hit with customs on either of these orders. It took between 3 and 5 days for each of the orders to dispatch and while shipping wasn’t quite as quick as from Hobonichi, it was pretty quick. I also used this shop to purchase a few accessories from that I didn’t pick up with my main Hobonichi order. It took around 10 days from placing an order to receiving it. I did pay more than I would have liked to, but it worked out cheaper than ordering from Hobonichi. Shipping: Cheaper than Hobonichi direct. Customs: You pay the customs up front which means no Parcelforce handling fee! Pros: Very quick (I received my order in 5 days). No having to pay the customs before you can get your items. Can find old discontinued items. Cons: Not everything is available, such as accessories. I had no idea until a couple of weeks ago that you could use Amazon Japan! The only thing you have to do is create an account with them and you’re good to go! Once you change the language, it’s relatively straightforward to use. Not all the accessories are available but if you want to just pick up a couple of the planners, this is probably my preferred option. You can also pick up other items too that are normally difficult to get hold of over here. I stocked up on Coleto refills with my order for instance. Shipping is cheaper than from Hobonichi direct, and you pay the customs charges upfront so you don’t need to worry about the handling fee. Shipping was super quick. I placed my order on a Saturday afternoon and it arrived the following Wednesday! The only thing to watch out for on here is that even if you filter your search results to items available internationally, you’ll sometimes get to the checkout and find out some of your items can’t be delivered. Shipping: Free on orders over £15. Customs: None, they’re UK based! Pros: Quick and UK based. Cons: No accessories available, a limited range. While I haven’t purchased a Hobonichi from TJS, I have ordered from here a few times now. It’s a great UK based stationery website where you’ll find the planners and some covers available. It’s a limited range but if you just want a planner and don’t want to wait, this might be a good place to use. They also sometimes have site wide offers that can help you save money – like £10 off a £50 spend. While I’d probably use TJS to pick up a Weeks, if I wanted a Cousin I’d use Amazon Japan as it works out cheaper. The Cousin on TJS is £60 yet I paid £67 for everything in the above Amazon picture. This really all comes down to what you want to purchase. If you want loads of planners, with lots of accessories then ordering from Hobonichi direct is the best place. While shipping and customs work out costly, it’ll work out cheaper than trying to source the accessories from a variety of different Etsy sellers. However, if you just want a couple of items, such as a Weeks and a Cousin, then Amazon Japan is by far the cheapest (and possibly quickest) route. This is where I’ll be purchasing mine from in future. This isn’t an exhaustive list of where to buy and if you want to purchase Japan only special editions, they will be trickier to get hold of. However, if you want items from the main range, then hopefully this little guide helps!